Before I entered primary school, I was an extremely stubborn, talkative and ‘guai lan’ type of child. Ever since I entered primary school onwards, I was often being told not to talk. I have then become reserved and aloof while paying attention to the happenings around me. Throughout years of such ‘trainings’, especially those years in Uni , I become more observant and sensitive for sensing the negative vibes around me. I become very guarded. I have never lowered my guard before. Through the experiences that my Uni friends have been through, I have become more skeptical. I have been wearing a mask and rarely easily trusted anyone since then… Truth always finds its way to reveal to me sooner or later. Recently, it has come to my attention that certain colleague of mine have been doing an action behind my back that I myself have condemned on. Not that this action is targeted at me or designed with the intention to harm me… But, the impact will still be there. He / She should not be carrying out such an action. He / She should know the consequences. I am really very disappointed in you if you really have done that. I know this might be a strong word to use but I really felt being “betrayed”! As a senior staff, you should know practically what can be done and what should not be done. Your action really makes me wonder if I could continue to trust you or be guarded towards you from now onwards! I finally see some light! Since I am currently waiting for my hair to be dry, I have decided to write a reflection article on my new working environment on an impulse. It is 1 year exactly now. I am actually surprised that I have stayed in this company for so long… Honestly, I do not have a good impression of this company, the working environment and the staff during my 1st day of work. Then came my colleague from my ex-company. Although her presence has helped to defuse a certain level of uncertainty, I am still feeling the stress. The stress level stems directly from the CEO and my colleagues in my department. I guess I have had a very sheltered, protected and smooth pathway in my ex-company. Lots of events took place during this 1 year. I have come to know my colleagues better. We are now able to share and joke amicably with one another. I have also learnt how to communicate with different personalities though there is still a huge gap for improvements. With the addition of a new consultant, things start to get better. At the very minimal, I no longer envision myself drowning in an open sea. He has helped to ‘tidy up’ and streamlining the processes and procedures. Through his workshops, I have seen unguarded facets of my colleagues’ emotions and personalities. Through these workshops, I feel that we have understood ourself better. We have also emerged out to be more approachable and relatively close with one another. Equality among both the gender? This topic has always been in existence. It has never been clear if such equality has been achieved in Singapore’s current society. There are too much grey areas to draw a distinctive line. At least this is my own personal view till my Christmas Eve dinner. For this year, 2015, both my hubby and I went to Todai @ Marina Bay Sands for our Christmas Eve dinner international seafood buffet. We had been seated among the tables catered for couples. A slightly young couple, maybe in their early 20s, were seating at my left. Lets call their table A. To my right, there was another pair of couple, maybe in either late 20s or early 30s. Lets call their table B. This year, instead of “attacking” the fresh oysters and big, fat and juicy crab legs, we have decided to eat other types of food offered in Todai. Most of the patrons had been busy stacking their plates with lots of oysters and Alaskan crab legs and pinchers before going back to their table. I was eating my roasted duck meat when I heard some ‘clanking’ sound, coming from my left (Table A, the young couple). Out of curosity, I turned my head slightly and peeped at the girlfriend. Her boyfriend, at that particular moment ,was still out there at the seafood buffet counter (2nd or 3rd rounds) and had not returned back to his seat. To my surprise, she seemed as if she was trying to arrange the seafood to make it looked nicer on her boyfriend’s plate! 😨 I was thinking that either both of us had a generation gap or that she was too bored waiting for her boyfriend and thus, started playing with the food. Then came the slightly older couple who were seated to my right (Table B). This table took quite a huge amount of seafood. Plates of Alaskan crab legs and pinchers and oysters had been placed on the table. Similarly, the boyfriend was often “making rounds” at the buffet counters. She had actually squeezed the lemon and put in the chilli sauce for all the 8 oysters that were supposed to be her boyfriend’s. She had also cut open the crab leg before passing it over to her boyfriend for consumption! This was the “role” of most of the guys in the past, especially during the courtship period. It seems that this role has been reversing slowly throughout these years. I was quite stunned! To summarise how I have spent my last five days (from CNY eve till yesterday), everything went off like a breeze! Hahah, I am also not quite sure how I spent my time away. I vividly remember that CNY eve was to have our reunion dinner with my parents in law. After that, my hubby and I were thinking of either to go to Chinatown or the Ang Bao River. In the end, we ended up watching Starhub cable TV instead as it will be very crowded over there. We have our reunion lunch with my parents on the first day of CNY instead. We then went to house visiting with parents. The usual custom applies. We greet our relatives, give the mandarin oranges to the elders and distribute red packets (as a form of good blessings) to the juniors. I think my hubby and I have also went to the Ang Bao River on this day too (if not, then it will be on the second day), during the evening if I remember correctly. End of the day. 21st Feb is a special date to me as this is the day I have arrived to this world. I remember dreaming of my Junior College friends, Marie and Susyna meeting up this CNY and catching up on latest news, okay, gossips, with one another when Marie has just out of sudden goes missing! This short dream ended with me and Susyna go searching for her. This day marks the commencement of praying to Tai Tsui for a smooth transition in whatever things we do for this year, the year of Goat. We have woke up early to go to the Chong Ghee Temple to go pray Tai Tsui. This is to avoid the crowd. Preparation for the arrival of Year 2015 Lunar Chinese New Year, the year of the Wooden Goat, is definitely not a easy task for me! The Lunar Chinese New Year (CNY) falls on this Thursday! I have just come to terms that yesterday night that I still have a lot of uncompleted tasks to carry out! Oh gosh! I guess my hubby and I will have to do last minute shopping later when we knock off and tomorrow as well, if the need arises. It will be a race against time! Everything will be purchased in a haste and the shopping malls will sure to be very packed! Argh!!! Oh god! I do so hate last minute shopping! Hopefully, by tomorrow evening, all the following tasks have been completed and my sudden panic attack will subside. May this 2015 Lunar Chinese New Year will be a smooth running year for all! Out of these 2014 Christmas gifts, the one that leaves a deep impression on me is the one my colleague, Jamie, has given. She has actually given me a bottle of hand gel wrapped in a paper bag. On top of this, she has also handmade a gingerbread man, attached a wooden peg to it and used this to secure the gift. Jamie has a flair in doing handicrafts. It is love at first sight when I have received this gift. Okay, it is more of love at first sight with the gingerbread man. It is so adorable! Its size is also just nice. I have jokingly requested for a female gingerbread man (Let’s call it gingerbread lady, shall we? =P). Guess what? Jamie has racked her brains and come out with a gingerbread lady for me within a few days after my request. Although I have not shown it (I belong to the category of “not capable to express sentiments freely”), I really feel touched. 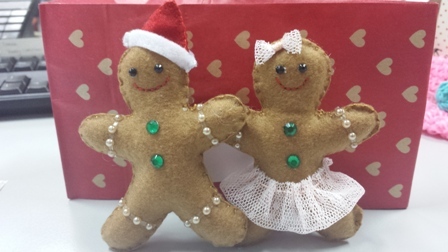 From the way she has created the gingerbread lady, she has put in efforts to create this gingerbread lady (a ballerina) although she is usually feeling exhausted when she reached home after work. Yes, I LOVE this gingerbread lady as well! Christmas is here! Merry Chirstmas to you and your family!